The afternoon was hot and the standard of bowls was even hotter. 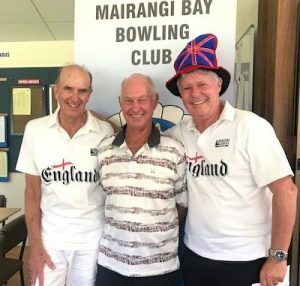 There was a strong field for the State of Origin afternoon with teams from the Hurricanes, the British Isles x 3, the Chiefs, the Blues x 4, the Barbarians, the Highlanders and the Crusaders, putting down the bowls in 2 bowl triples. Many thanks to the organisers for sorting out the draw, handling the late cancellations, getting the greens marked up and making sure the bevvies were kept cool for the aftermatch function. Well done also for sorting out the teams so that there ended up being no 3 winners on the day, but 7 two winners to share the 3 prizes. So hard luck to the to the 4 two winners who failed to get a mention in the prize giving. Congratulations to the team of John Gledhill, Steve McGregor and Bob Mullen, who while representing the British Lions, managed 2 wins, 21 ends and 40 points to take out the number one slot. In second place, with 2 wins, 18 ends and 37 points were Sheryl Wellington, Geoff Ladd and Marie Cooper (the Chiefs). And the final prize winners were the team of Jan Gledhill, Jo Baxter and Graham Ward (also the British Lions).